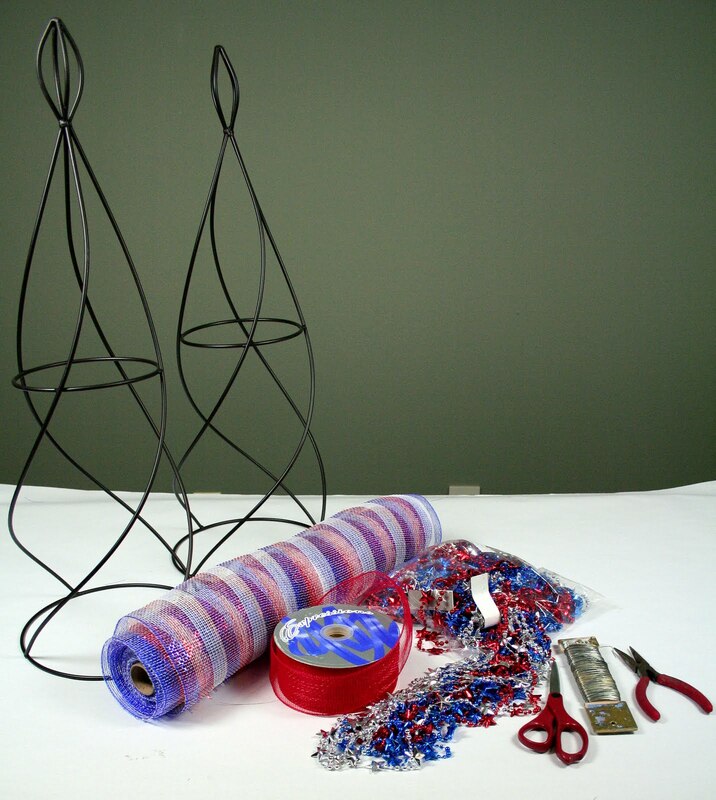 Transform simple wire garden topiary forms into party decorations for any type of holiday with a roll of decorative mesh garland. 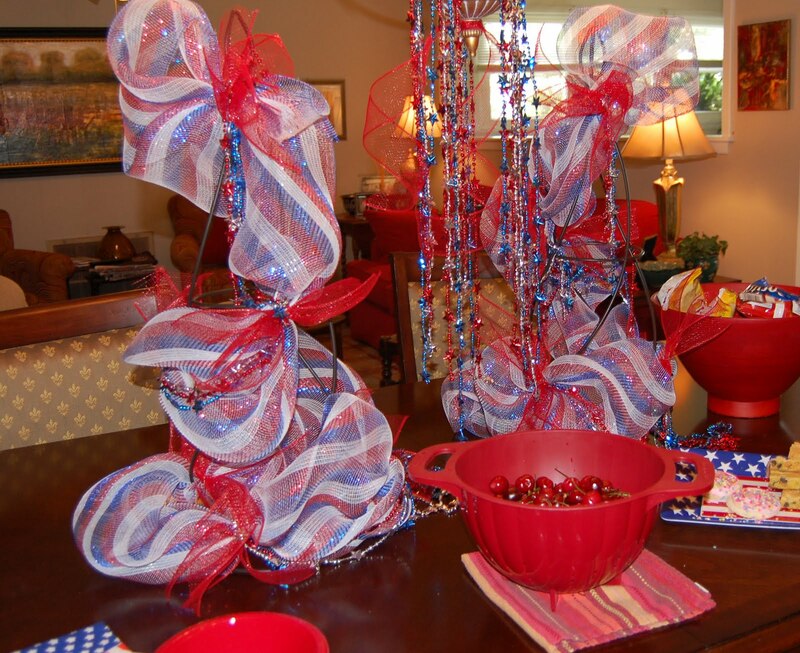 The decorative poly sinamay mesh in metallic red, white and blue stripe was the inspiration for this patriotic party topiaries. This sinamay style art mesh has been used by florist for years and is now making its way into home decorating. With a little creativity and some sparkly star shaped red, blue and silver Mardi Gras beads, you can turn this everyday garden topiary into a fun red, white and blue centerpiece. This sparkly star topiary would be perfect for your July 4th or Memorial Day party. See the tutorial below for instructions on how to create this centerpiece. Cut floral wire in 12" sections. For this topiary we used approximately 8 pieces of wire. You may need more or less depending on the height of your topiary form. Gather the end of the 21" wide red, white and blue striped poly mesh together. About 12" down from the end, fold over the mesh to form a loop.Gather this section together with the end piece. Wrap a piece of floral wire around these two sections securing them, to form a puffy loop. 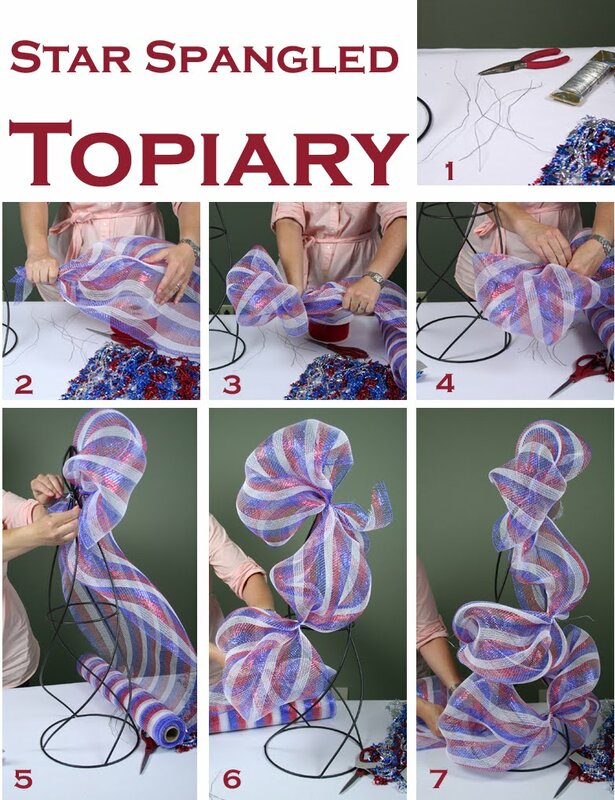 Attach this loop to the top of the topiary form by wrapping the attached floral wire around the top finial of the topiary form. Leave the wire ends poking out for now so you can attach additional ribbon and beads here later. Move down and around the topiary form bunching the mesh garland by gathering sections of mesh and attaching with floral wire. Leave all the wire wire ends poking out. Continue to bunch and gather the mesh down and around the form. The garland should be circling the form as shown. At this point the decorative mesh garland should be forming to the shape of your topiary form. When you get to the bottom of the topiary form, attach the decorative mesh at the bottom with a piece of floral wire and cut the mesh about 12" out. Finish off the bottom with a second loop like the one on the top. Simply fold over the remaining 12" piece of mesh and wire it the end onto the topiary form. Leave the end wire pieces open. 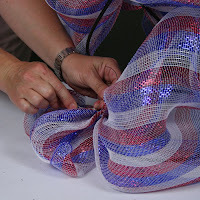 Using the 2.5" red mesh ribbon, make a double sided loop approximately 2 feet total. Cut the two ends of the loops to make three short pieces of ribbon. Gather up the center section of these three ribbons and attach to the top of the topiary with the floral wire you left open at the top. This red mesh ribbon creates a puff of accent color around the topiary. 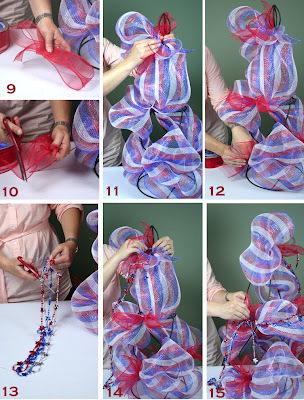 Continue to cut pieces of red mesh ribbon and attach them down the topiary form. Attach at each section that you have wire on the topiary form. Sort the assorted red, silver and blue Mardi Gras beads and pull out three beads, one in each color. Cut these 3 beads in one spot to make a long garland like section. Attach these star beads to the top of the topiary with the floral wire already there. Leave a small tail of beads dangling down on one end with a longer section that you will wrap around like garland. Move down the topiary form, wrapping the longer length of beads around the mesh. Attach the tail end of the beads to the next wire. Continue adding beads around the form as needed.When you are finished attaching the beads,wrap the remaining floral wire pieces to the center of the topiary form so they do not show. The finished red, white and blue topiaries really pop with color. Line these topiaries down the center of a food table or stagger them on a buffet table against a wall. Shown here on a dining room table the topiaries add a festive element to the table scape. Star shaped Mardi Gras beads left over from the topiary project were draped from chandelier for another fun touch. 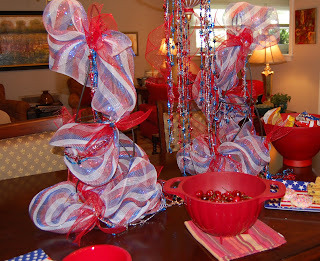 Looking for more Patriotic themed party supplies? Click here for more deco mesh sizes, colors and patterns. MardiGrasOutlet.com carries even more types of beads, such as braided, American flag specialty beads and a variety pack of simple red, white and blue strands. Where ever you decide to use these festive red, white and blue topiaries, they are sure to make a big impact! Great idea! 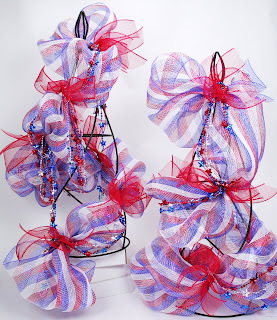 These would go well with YankeeScents.com's red, white, and blue Fourth of July potpourri.